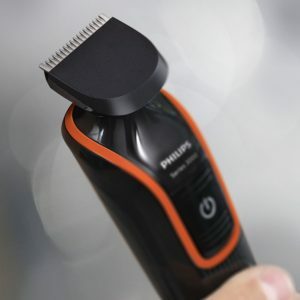 As the name suggests, the Philips QG3352/23 Series 3000 model single handedly solves all your beard, facial hair and body hair trimming concerns in one go. This is an all in one model which comes with eight attachments so that you can flaunt different styles with absolute ease and confidence. This is one of the most versatile trimmers available in the market today, for all the right reasons. Say goodbye to irritating and uneven cuts and long hours spent in trimming your hair. With this all in one trimmer, you can now choose the exact length of trim/cut that you want and carry off your style with great comfort. Read through our body trimmer review of all the features, pros and cons of this trimmer herewith. hair comb 19 length settings from 3mm to 20mm. This could also be used to trim a long beard, if you have one. Beard trimming functionality is not of the expected quality, but with all the versatility it may make sense to use this as your body trimmer and purchase a separate beard trimmer. 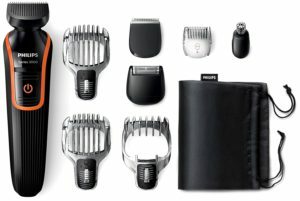 If you are looking for a versatile trimming/shaving kit that allows you to choose different styles at different lengths at an affordable price, the Philips QP3352/23 Series 3000 All in One Beard, Hair and Body Trimmer is undoubtedly the right choice for you. While the multi-groomer has some shortcomings, it cannot be denied that it provides you more services and features than what it is charged for. A good trimming kit will pay dividends for you in the long run. The reviews bring it in at 4 out of 5 stars with 72% higher than 4 stars, and under 5% of one star. It is in the top ten for best-selling body groomers online.